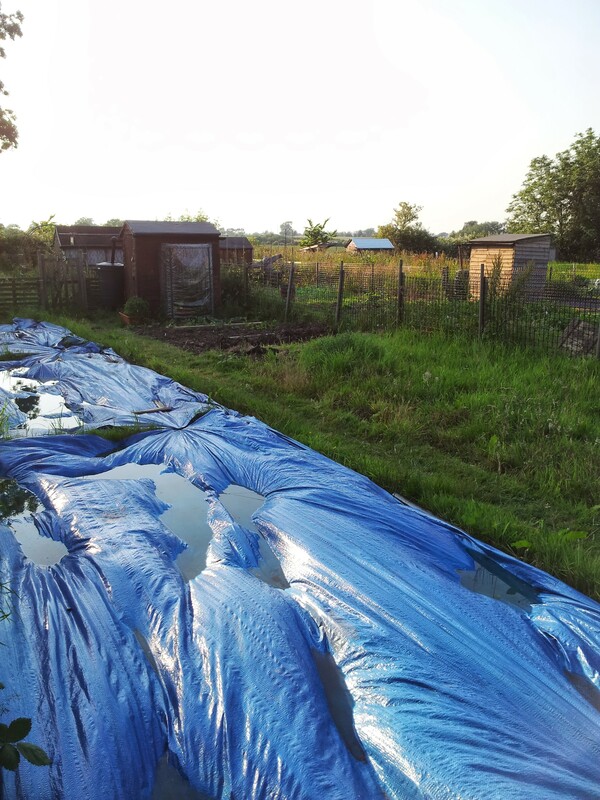 “What?” I hear you cry, a non-allotment based blog post? Yes indeedy… Well, if you head over to the Scholastic site, you’ll be able to order yourself a free copy of the National Curriculum in printed format. As it says, the “National Curriculum for 2014 has now been released, but for the first time, it is available from the DfE in digital format only. So head over to the site and get a copy ordered. What a day. 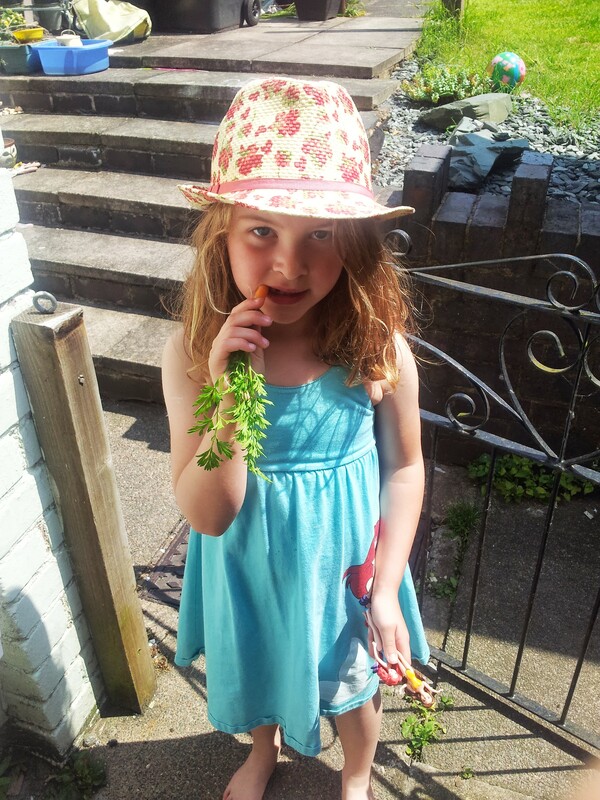 Andy Murray won, we ate our first radishes and Elizabeth ate the first (small) carrot! I also dug out another spades width of the allotment, which from one angle looks great and the other angle is pretty depressing. I know the thing about being patient, but I’m not renowned for that…hey, at least I’m learning something! 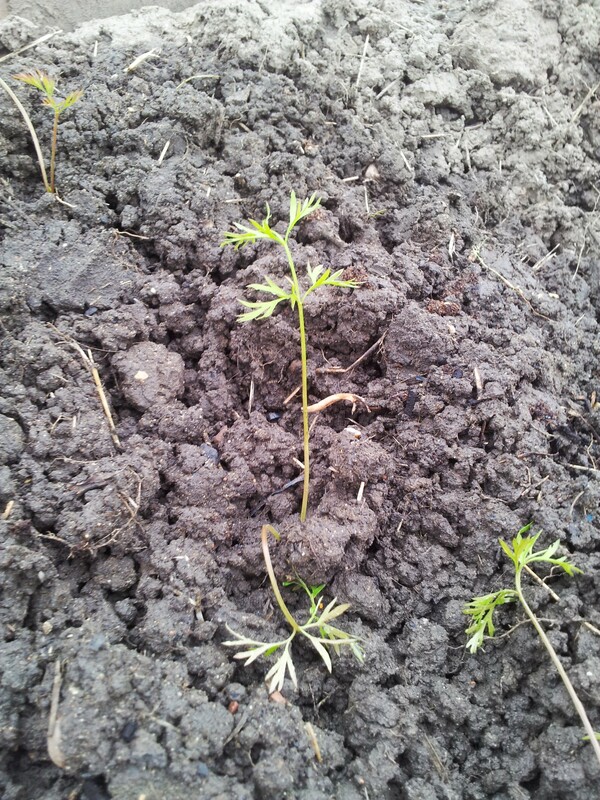 Mum and Dad dropped around a raised bed for my asparagus bed yesterday. 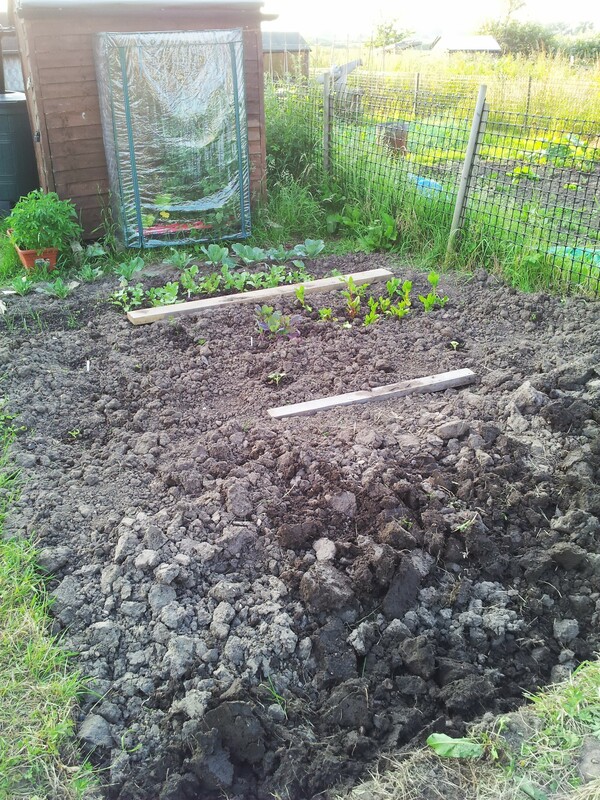 That is going to be the last part of the allotment, so this is going to be a good test of patience! The sun is really helping the veg grow, and the difference in the size of courgette plant in the mini greenhouse is huge compared to the ones that are planted out. The weeds are trying to mount a coup, but I have my sturdy hoe – they are no match for us 🙂 The chard is going well, which brings me to my next question – what is chard, and how the hell do you eat it?! 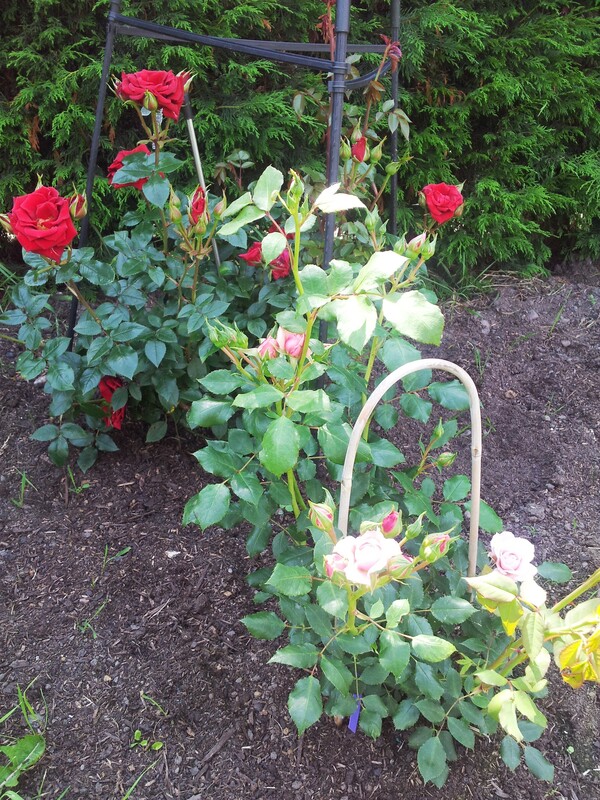 And, in a bonus feature, our roses are blooming marvellous! Slugs! Buggers I say. 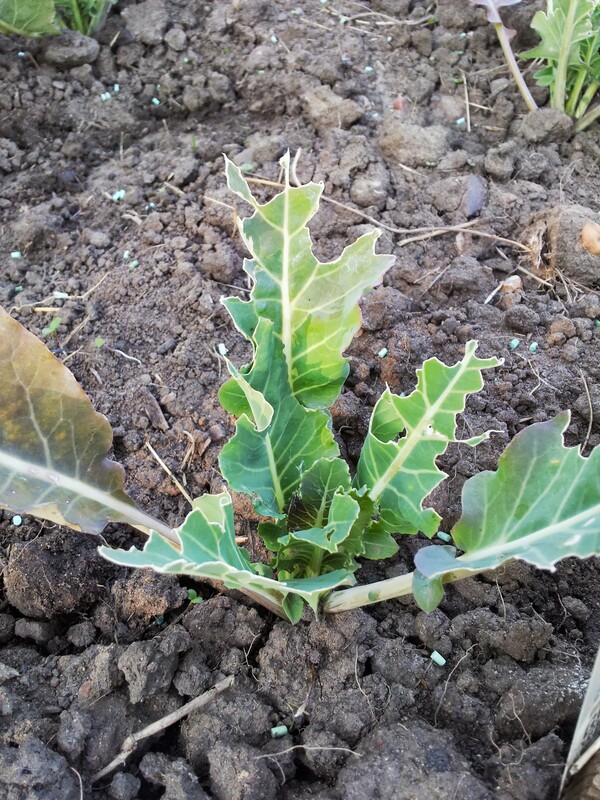 I caught them nibbling, nay feasting on our poor bedraggled cauliflower today. More pellets dispersed and slugs slugged. I also dug out two more spade-widths of the plot – about half a metre.The ground is lovely to dig through at the moment – just like a rich chocolate cake. There seem to be fewer weeds in the middle, and I’m hoping it stays that way! I picked out some of the weeds that are around the radish and courgette and then made sure the tomatoes are happy. I still don’t know what the tomato bush is…all I know is that it doesn’t look like a tomato plant! 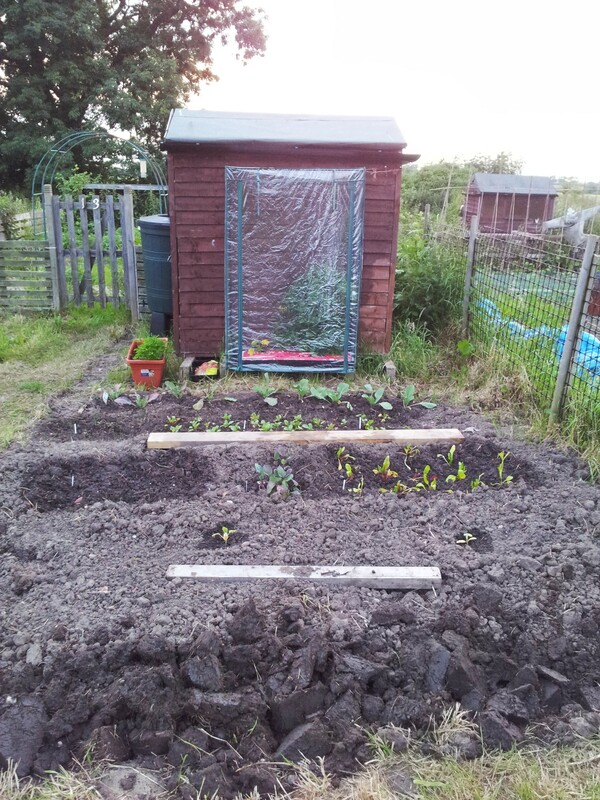 I went to re-plant the new courgette/squash last night, and to water the tomatoes. I’m still amazed at quite how well the vegetables I thought had failed are doing. Red Delicious Sprouts: I’m a tad hit-and-miss on sprouts, but these red ones look cool. As with all of these original veg, I split them out when planting in the ground, one plant looks okay, the other a bit tired! These look very cool – but won’t be ready until December, just in time for Christmas. Courgette Orelia: Yellow courgettes. These were the ones I thought were most under threat of not making it after replanting, but seem so have made a recovery. Purple Haze Carrots: Purple carrots. Apparently orange carrots (according to the Carrot Museum, for there is such a thing) were cultivated for the House of Orange. The original carrot came from Afghanistan and Iran, and the colours were many and varied. Tigerella Tomato: So far so good. This one is a bit odd in that all the images that I can see around the web are of traditional tomato plants. Mine is more bush-like. So what we get is a mystery. As you can tell, I’m verging on over-excited. We only popped down for five minutes to water the tomatoes, and then got distracted by two very cool things. Number 1: Rob, our next door allotment neighbour, had left us some funky courgettes. 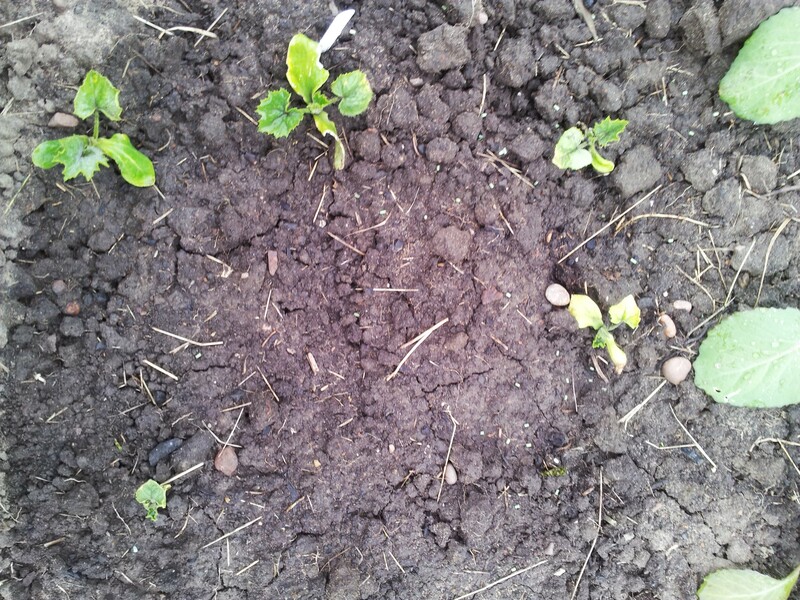 He’d mentioned them to me about a fortnight ago and he then went and left us three to plant. 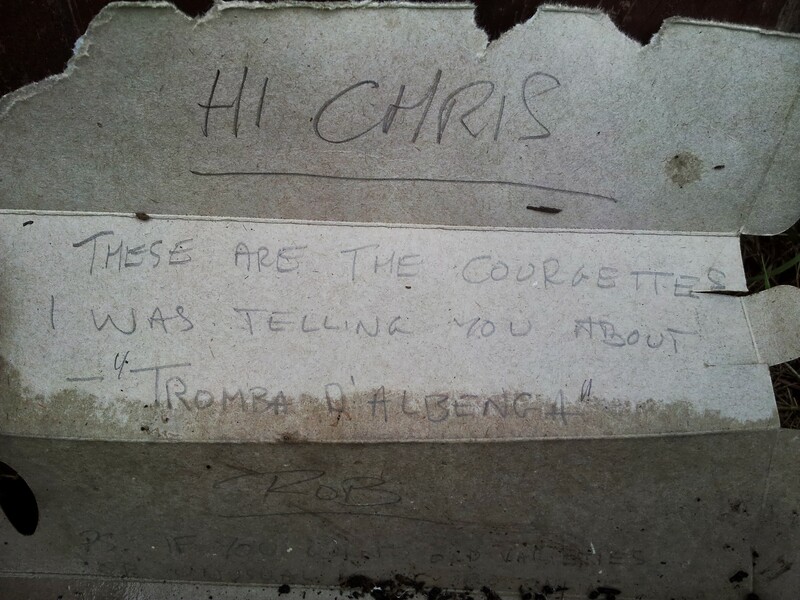 They are ‘Tromba Albenga’ which is a cross between a courgette and a squash from Italy. 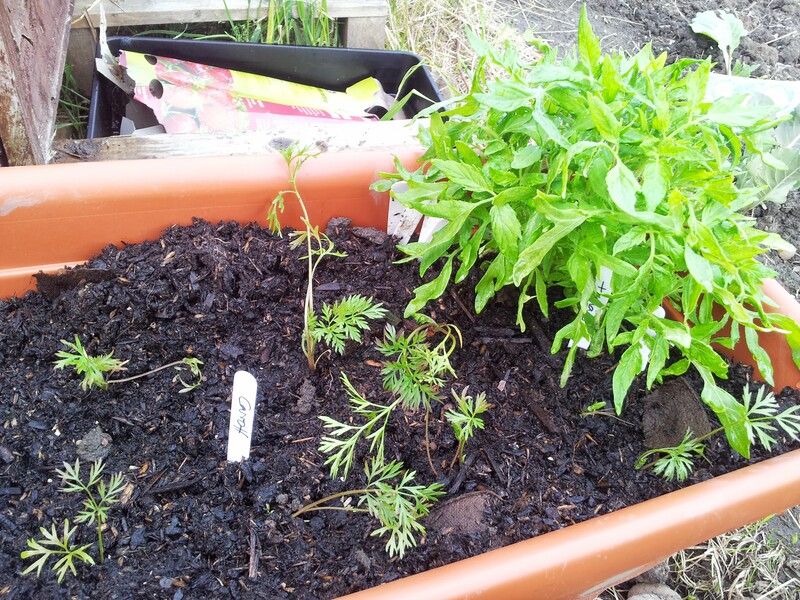 I read up on ‘how to grow‘, but unfortunately after I planted…so it is possible I planted them too closely together! I’ll go and re-space them tomorrow. Thank you Rob, you are fab! Number 2: vegetables are growing! And I mean really growing. The carrots are going for it, the original courgettes that I thought had not mad it are going strong, the spring onions are upright and the radish are all looking happy! Woo, and I say hoo! The only thing that we have an issue is with slugs…so pellet time, sorry slugs. The only thing I wish I did was to check the type of tomato that I put in the trough. It is growing like a bush, rather than on stalks, so I’m a tad confused. I’ll have to go and research. I say ‘dig’, you say ‘ow’… just me then. I measured how much more digging there is to do on the current side last night, and there was 30ft in length. Today I dug 2ft. 28 to go (see, I can even do maths after digging!) Essentially it is all the darker soil at the front of the photo below. The allotment was graced with a visit from Jet and Elizabeth and Elizabeth played with the dog from the next door allotment. It was very funny to watch, she was so happy. I have a feeling that a few of the things I have planted won’t make it. 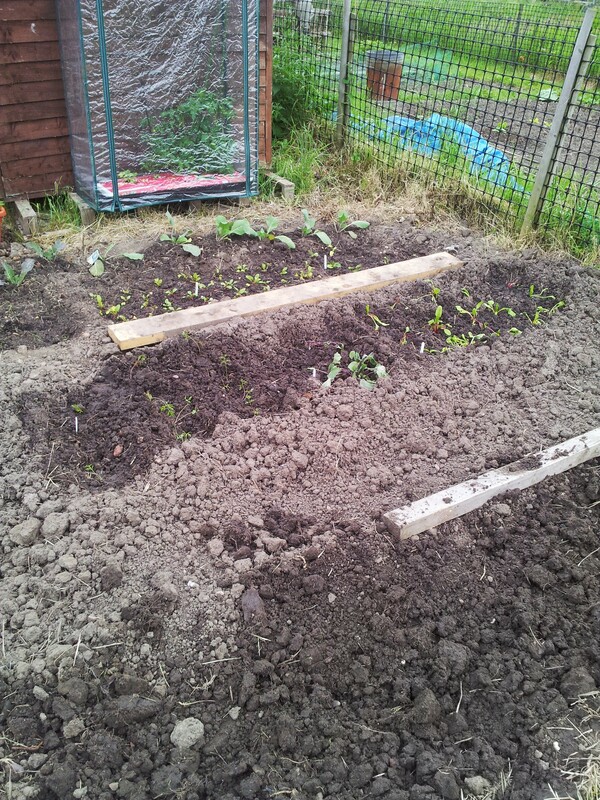 Ironically, it appears the carrots will do well, it is the courgettes and chard that look knackered. We’ll see.